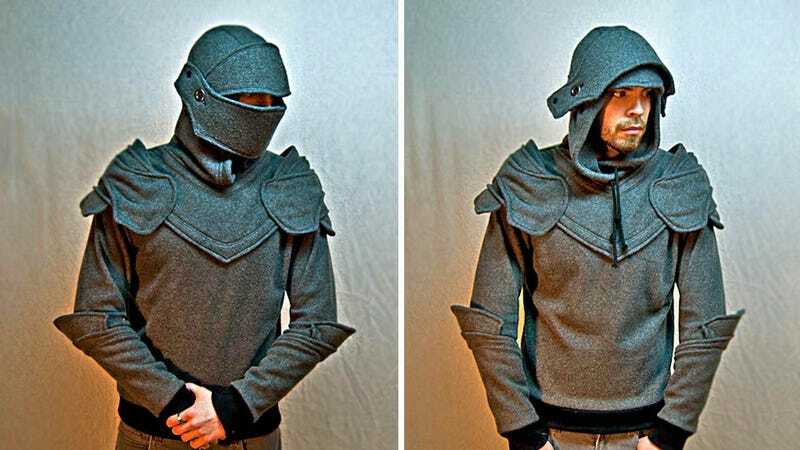 One hit from a sword and you'll be dead faster than your social standing once you wear this out in public, but you won't find a more comfortable suit of armor than this plated hoodie created by Etsy seller Chadwick Dillon. It comes complete with a fully retractable face plate and visor built into the hood, so you can be protected from attacking marauders, or just the rain—whichever happens to be your most pressing issue. Unfortunately, you can't order one just yet, but once Chadwick (a perfectly matching medieval name we might point out) gets his Etsy shop in order, you'll be able to order thine self this fine garment and impress the damsels. Update: The Knight Hoodies are finally available, including official Game of Thrones versions, and can be ordered here for a mere $100—far from a king's ransom.